Spreedly helps fast-growing companies build more innovation into their commerce applications. A key way we do that is through our card vault. 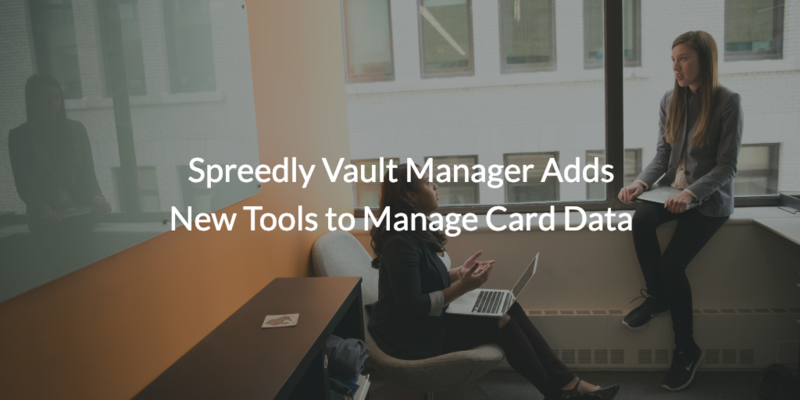 We've built more functionality to help you control stored cards with Spreedly Vault Manager, including the addition of dashboards and centralized management tools. Now, with this new release, your team gets even more power. Credit cards (and card data) are among your most critical strategic assets. Behind each vaulted payment method is a future revenue opportunity and a rich source of historical transactional behavior and metadata that companies are deeply invested in protecting, analyzing, organizing, and leveraging as an input to strategic decision-making. Spreedly's vault is a universal tokenization solution that provides a PCI-compliant way to easily capture, store, and use payment methods to transact with any payment service or endpoint. Organizing and understanding the card assets in your Spreedly vault can be a major benefit to your business. You might want to organize cards to identify: Which cards belong to which merchants? How many active cards are there on your Silver pricing plan? Which industry vertical represents the best target for upsell based on volume of subscribed cards? Answers to these questions are critical to informing strategic decision-making. Starting today, when adding or updating a payment method in your Spreedly vault, you can now attach relevant business attributes to the card. Simply define a custom metadata key (like `customer_id`, `customer_segment`, `geo`, `currency`, `pricing_plan`, etc.) and populate it with any string value. You can then use our `List` API to query for cards that match one or more metadata values to better segment and analyze card assets by any business criteria important to your organization. Coming soon, we'll be adding the ability to leverage card metadata downstream in the Spreedly application to enrich insights into transactions and more. See the Request Body API documentation for implementation details and get started today.